When I first started reasearching tag games, I had no idea they went by so many names. Tag can also be called tip, tick, tig, tiggy, dobby, it, and chasey. Tag is a game played mostly outdoors and is known worldwide. There are many variations, several of which we have the rules posted here for your enjoyment. Most forms have no teams, scores, or equipment necessary. 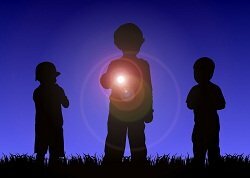 The kids pictured here are playing one of my favorite forms of tag, which is called "Flashlight Tag" where I come from. In games of chase and tag, the object is to tag, or touch, other players who are then out of the game. Usually one player is 'It' and has to chase and tag the other players, one of whom then becomes the new person who is 'It.' By changing the rules of Tag, the game can stay fresh and exciting. It is common, but not completely necessary to have a home base while playing tag. Players may be safe from being tagged under certain circumstances: if they are within a pre-determined area, off the ground, or when touching a particular structure. This safe zone has been called a "gool", probably a corruption of "goal". The term "gool" was first recorded in print in Massachusetts in the 1870s, and is common in the northern states of the US. Variants include gould, goul, and ghoul, and alternatives include base and home. There are many variants which modify the rules for team play, or place restrictions on tagged players' behaviour. A simple variation makes tag an elimination game, so those tagged drop out of play. A no tag-backs, no returns, or can't tag your master rule prevents a player from tagging the person who has just tagged them. Any game of tag or chase can be added to using these varients. Now get out and have some fun playing these tag games!